There are many haunted castles in the world and perhaps no more so than in Scotland. Scottish castles are numerous and all with their own story to tell. Centuries of feuding both amongst the clans themselves and against the English provide an amazing and colourful backdrop to the profile of so many castles in Scotland. No wonder many of them are haunted! Take Glamis Castle for instance which is reported to be haunted by more than one ghost. These include the Grey Lady and the White Lady have both been seen at Glamis Castle. The White Lady has been seen the least but is thought to possibly be the ghost of Janet Douglas. She was wife to the 6th Lord Glamis (John) back in the 16th century and after his death became wife to Archibald Campbell; she was imprisoned in Edinburgh Castle by King James V and later burnt at the stake on Castle Hill. 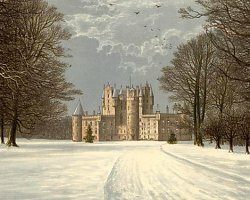 Another ghost is believed to be that of Earl Beardie, a gambler and card player whose strange story is well worth reading in full on our Glamis Castle page. Skibo Castle is another reputedly haunted castle in Scotland. Renovated by Andrew Carnegie in the early 20th century, Skibo Castle is a wonderful example of castle architecture and design and was chosen by Madonna and Guy Ritchie as their wedding venue back in 2000. The main ghost at Skibo Castle is that of a girl who is said to have disappeared there whilst on a visit. At the time it was thought she was murdered by the Castle's keeper who hid her body within the grounds. In later years during renovations, a female skeleton was found behind one of the castle walls!